In building, renovating or simply sprucing up your own home, you can find inspiration from your favorite things. You can capture the beauty of a tropical island or even follow the colors found in an abstract painting. 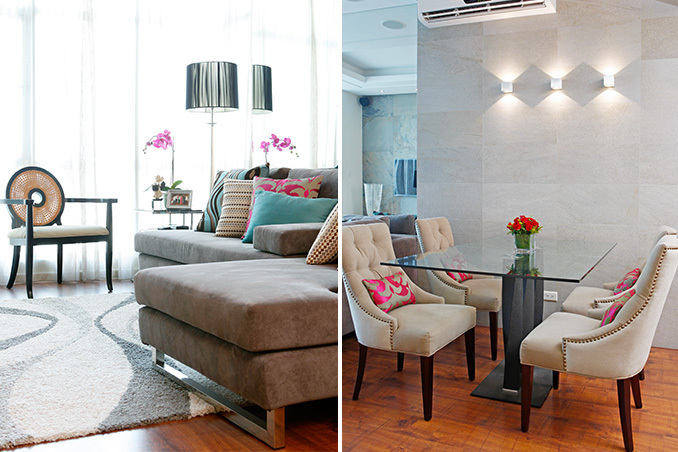 For their 80sqm condo, homeowners Rayne and Sky wanted something similar to the chic, stylish spaces featured on Gossip Girl, a now-defunct teen-oriented drama set in New York City. Architect John Yuyucheng rose to the challenge with a classic and luxurious design that still has a modern and youthful appeal. This balance between the old and the new is achieved through soothing neutral colors paired with vivid hues like turquoise and fuchsia. The opulent feel of the plush, fully-upholstered chairs is also tempered with unexpected patterns. Original article by Sunshine Selga Funa. Pictorial direction by Dagny Madamba. Photographed by Miguel Nacianceno. Read the original article (“Uptown Chic”) in the May 2012 issue of Real Living Magazine. To download a digital copy of Real Living Magazine, visit Summit Newsstand at https://summitnewsstand.com.ph/real-living.